We are very excited to be offering this unique hunt through our partners in Greenland. This is truly one of the last frontiers on the planet with the polar ice cap stretching for hundreds of kilometers, pristine wilderness and an abundance of wildlife and fish. We are able to offer a variety of four hunting opportunities at different times of the year. 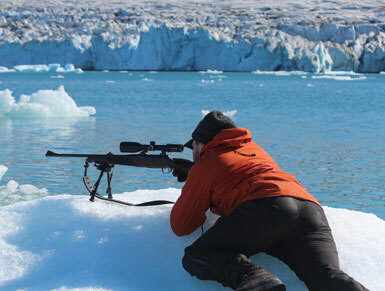 Three are from August to October and for the more adventurous we can offer an experience of a life time hunting on the ice during March and April. 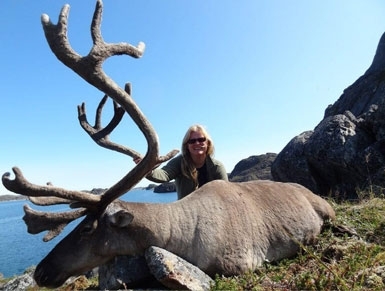 We can offer hunts from the comfort of a permanent hunting camp in south west Greenland a 3 hour boat ride from Narsarsuaq (or 30 min helicopter flight) this is an 8 day trip with 6 hunting days and fishing if time permits, accommodation is in cabins with 4 per cabin and shared bathroom facilities. Hunting is done by spot and stalk from boats or on foot returning to the camp each evening. Arrival is via Reykjavik Iceland with return flight to Narsarsuaq US$1,100 per person. 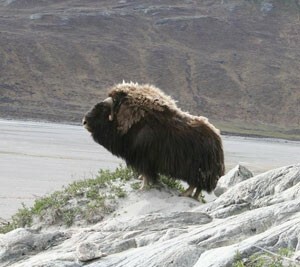 This hunt is for Musk ox only from August to end of October near Kangerlussuaq west Greenland. 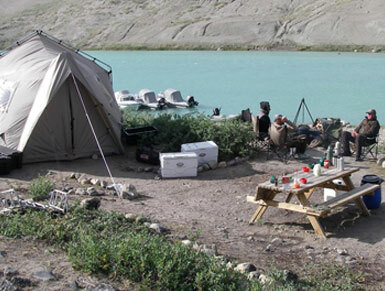 A comfortable tented camp is set up on the Robinson River with separate tents for hunters, guides and a kitchen tent. The hunting is done on foot spot and stalk although with the abundance of game it’s unusual to walk more than 5 klm from camp across the Arctic tundra each day. Trophies and meat must be carried on foot so you need a good level of physical fitness for this hunt. In August and early September its daylight for most of the day so you’re hunting time can be greatly extended if you wish. 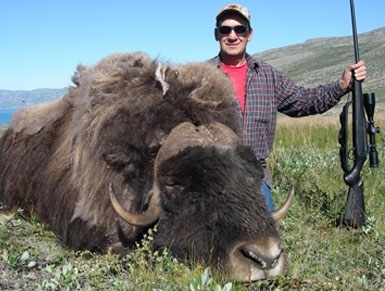 After your musk ox is taken you take some time to fish for the famous Arctic char in the pristine rivers. Arrival is via Copenhagen with the return flight to Kangerlussuaq around 900 euros. For those hunters who don’t want the trouble of taking your own rifles you can hire rifles from the outfitter for 150 euro including ammo. 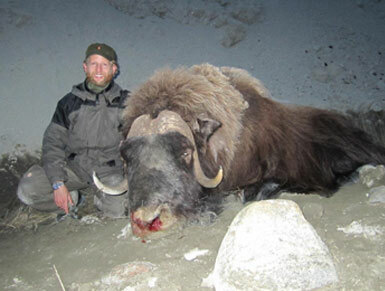 This hunt is for those wanting to experience the real Arctic with temperatures down to – 40 Celsius at times! 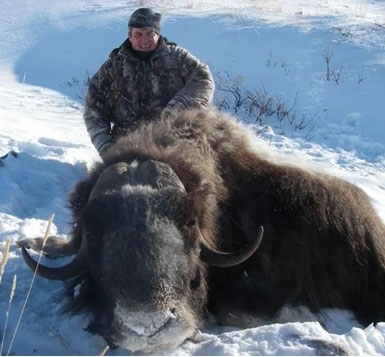 Hunting is done by spot and stalk from ATV’s and snow mobiles with the final stalk done on foot, the trophy and meat will also be recovered with the aid of ATV’s. 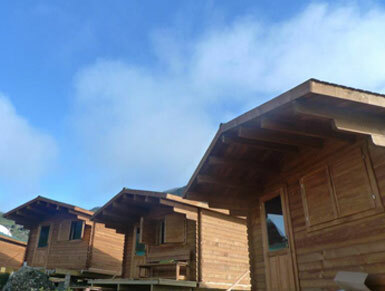 Accommodation is supplied in heated tents or in cabins depending on the areas to be hunted. 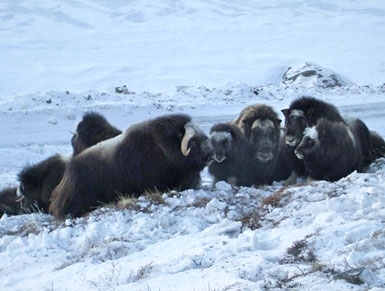 This is a unique hunt in the true wilderness of the Arctic Tundra in the pristine wilderness that is Greenland for an animal that has survived unchanged since the last Ice age. The game is plentiful with breathtaking views and the chance to catch a glimpse of the Aurora Borealis (Northern Lights) and the opportunity to fish untouched water for the famous Arctic char. What more could you ask for in and adventure hunt.